[154 Pages] The global market size of antifoaming agent was USD 5.29 billion in 2015, which is projected to reach USD 6.59 billion by 2021, at a CAGR of 3.8% between 2016 and 2021. In this report, 2015 is considered as the base year and the forecast period is between 2016 and 2021. Antifoaming agents include both antifoaming agents and defoamers. These terms are used interchangeably in the industry; however, both have different definitions. Antifoaming agents are surface-active agents that are added to the industrial processes to prevent foam generation. These agents inhibit the formation of foam by chemically reacting with water and air particles. On the other hand, defoamers are surface-active agent that act when the foam is formed. With a knock-down effect, they spread on the foam surface and act on the lamellas, which leads to release of air. Oil-based antifoaming agent and powder antifoaming agent contain oil as the carrier fluid. The oil can be mineral oil, white oil, vegetable oil, or any other oil that is insoluble in the foam medium. The oil substrate sticks to the walls of vessel, which also results in clinging of various particles in the liquid to the wall. These particles react with the air and release foul odor. Oil-based antifoaming agents release more volatile organic compounds (VOCs) in comparison to other types do, which can cause health problems in humans. With rising awareness of environment concern and demand for biodegradable antifoaming agent in almost every end-use industry, the need to switch to better alternatives adhering to environment regulations has increased. Regulations set by agencies such as Registration, Evaluation, Authorization, and Restriction of Chemicals (REACH), Food and Drug Administration (FDA), Environmental Protection Agency (EPA), Federal Institute of Risk Assessment (BFR), and various NGOs have aided in fuelling the growth of the antifoaming agent market. To analyze competitive developments such as expansions, contracts & agreements, joint ventures, and new product launches in the antifoaming agent market. Note:* Core competencies of the companies are captured in terms of their key developments, SWOT analysis, and key strategies adopted by them to sustain their position in the market. This research study involves the extensive use of secondary sources, directories, and databases (such as Hoovers, Bloomberg BusinessWeek, and Factiva) to identify and collect information useful for this technical, market-oriented, and commercial study of the antifoaming agent market. The primary sources mainly include several industry experts from core and related industries and preferred suppliers, manufacturers, distributors, service providers, and organizations related to all segments of the industry’s supply chain. After arriving at the overall market size, the total market has been split into several segments and subsegments. The figure below illustrates the breakdown of the primary interviews based on company type, designation, and region conducted during the research study. The value chain of antifoaming agent starts with the procurement of raw materials required for its manufacturing. The main raw materials used for the production are organic oil, wax, and silica. These different sources of raw materials are mainly used to obtain an agent that serves different applications efficiently. These raw materials are supplied to the antifoaming agent manufacturers such as Air Products and Chemicals Inc. (U.S.), Dow Corning Corporation (U.S.), Evonik Industries (Germany), BASF (Germany), Kemira (Finland), Ashland (U.S.), Elements Plc. (U.K.), and Shin-Etsu Chemical Company Ltd. (Japan). Major value is added to the antifoaming agent during the manufacturing process. A great amount of effort and expertise is required, mainly in formulating the antifoaming agent for different applications. The major applications where these manufacturers supply antifoaming agents include pulp & paper, oil & gas, paints & coatings, water treatment, food & beverages, detergents, pharmaceuticals, textiles, and others. In April 2016, Kemira Oyj successfully started its new production plant of sodium chlorate in Ortigueira, Brazil. For the on-site production of chlorine dioxide, which is a main bleaching agent for bleached pulp generation, sodium chlorate will be produced in this plant. In May 2016, the specialty and coatings additive business of Air Products and Chemicals was acquired by Evonik Industries AG for USD 3.8 billion, for which the transaction will be carried out later in the year. The acquisition strengthened the company’s foothold in the North American and Asian markets. In March 2016, BASF launched Efka PB 2744, a fast and effective defoamer for 100% solids coating systems, especially designed for industrial flooring formulations. Raw material suppliers and others. This report categorizes the global antifoaming agent market based on type, application, and region. Why the manufacturers are shifting from petroleum feedstocks to vegetable or biodegradable feedstocks? The global market size of antifoaming agent was USD 5.29 billion in 2015 and is projected to reach USD 6.59 billion by 2021, at a CAGR of 3.8% between 2016 and 2021. 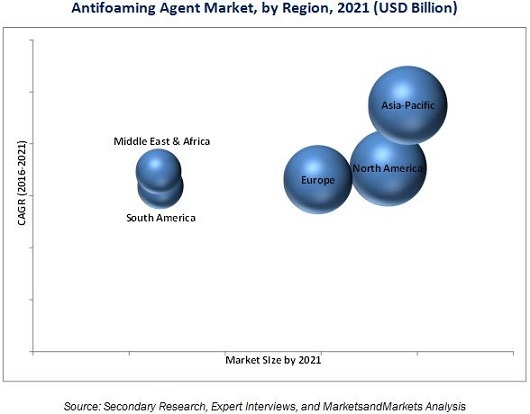 The growing manufacturing sector in all regions is expected to generate demand and drive the antifoaming agent market during the forecast period. Antifoaming agent comprise four ingredients, namely, carrier fluid, active ingredient, surfactants, and stabilizing agent. Carrier fluids are usually oils (vegetable/mineral/silicone-based oil) that have lower surface tension; these are insoluble in the foaming medium. Active ingredients are fine solid particles that spread on the foam surface and physically disrupt the foam walls. Surfactants are surface-active agent that help in preparing stable emulsions of carrier fluid in diluents. They help in dispersing and spreading the antifoaming agent in the medium. Stabilizing agent, including water, are used to minimize the dosing of antifoaming agent to make them cost-effective. On the basis of application, the market is divided into nine major segments, pulp & paper, oil & gas, detergent, water treatment, paints & coatings, food & beverages, textiles, pharmaceuticals, and others. The pulp & paper application dominated the antifoaming agent market during the forecast period, closely followed by paints & coatings in 2015. The antifoaming agent market is classified based on type: water-based, oil-based, and silicone-based. The market is dominated by silicone-based due to their enhanced properties such as low surface tension, chemical inertness, thermal stability, and complete insolubility in water. The silicone-based segment is also projected to be the second fastest-growing type of antifoaming agent during the forecast period. Currently, North America is the largest antifoaming market, in terms of value, closely followed by Asia-Pacific. Some of the factors driving the growth of the North American market are high growth of end-use industries, local manufacturing, and increased number of domestic players in various market segments. Asia-Pacific is expected to be the fastest-growing antifoaming agent market due to high demand from pulp & paper and paints & coatings applications. The presence of major countries such as China, India, and Japan is also a major driver of the antifoaming agent market in the region. Pulp & paper is largest application of antifoaming industry. Paper mills are located in more than 100 countries across all the regions. China, the U.S., Canada, Japan, Sweden, and Finland are the major producers of pulp & paper. Pulp & Paper is the largest market for antifoaming agent, as they play a major role in producing high-quality paper products efficiently and cost-effectively. With the rising consumer awareness for environment safety, the paper industry has seen a downfall in demand. This is because of the digitization as consumers are more inclined toward the use of electronic items rather than paper. Antifoaming agents are used in the oil & gas industry during drilling, extraction, and transportation. Foam is produced with the application of treatment fluids during drilling or extraction process, which may cause issues in pumping process. Antifoaming agents are used to control foam formation in the oil well and help in efficient treatment and disposal of treatment fluid. The trend is expected to decline in the industry due to falling crude oil prices and less oil exploration activities. The increasing use of waterborne coating system has resulted in the demand for efficient antifoaming agent. Antifoaming agents are used during the manufacturing of liquid paints & coatings. These agents are used to reduce the formation of bubbles, resulting in high-quality surface finish during the application of paints and coatings in automotive, buildings, and packaging. How the major developments by the manufacturers will impact the market in short-term and long-term? What are the upcoming product type of Antifoaming Agents Market? The major restraining factor for the use of oil- and water-based antifoaming agent is their high loading levels, which affect the chemical structure of the polymer. On the contrary, silicone-based antifoaming agent is used in a much smaller ratio. Some of the important manufacturers are Air Products and Chemicals Inc. (U.S.), Dow Corning Corporation (U.S.), Evonik Industries (Germany), BASF (Germany), Kemira (Finland), Ashland (U.S.), Elements Plc. (U.K.), and Shin-Etsu Chemical Company Ltd. (Japan). Companies in this market compete with each other in terms of prices and product offerings to meet the market requirements. 11.3 Air Products and Chemicals, Inc.
11.7 Shin-Etsu Chemical Company Ltd.